The ’80s were a time when action was a big part of the movie industry. Actors such as Sylvester Stallone, Arnold Schwarzenegger, and Jean Claude Van Damme filled the theaters with excitement as they displayed high kicks, muscles, and guns while taking out everyone who got in their way. With that, here are our picks for the top 10 best action movies of the ’80s. 10. Commando: This starred Arnold Schwarzenegger as John Matrix, a retired special agent who lives in a secluded home in the mountains with his daughter Jenny, played by a young Alyssa Milano. After Jenny is kidnapped by one of Matrix’s old foes, he is quickly forced out of retirement to try and get her back. This film is a guns blazing all out action explosion. Farfetched but watchable at the same time, it makes leaving the television screen much more difficult. 9. Lethal Weapon: An L.A. cop named Martin Riggs played by Mel Gibson, with suicidal tendencies who also happens to be a trigger happy maniac is paired together with an unlucky aging police officer, Roger Murtaugh, played by Danny Glover. Together, they unveil a huge drug-smuggling operation, and while their teamwork improves, so does their friendship. “Lethal Weapon” is an all out shoot em up action flick, with great chemistry between both Glover and Gibson. It is a film that is still talked about today, and has many memorable scenes. A great action cop classic this film is. 8. Predator: A team of special force ops, led by a tough, but fair soldier, Major “Dutch” Schaefer, Schwarzenegger, are ordered to assist a member of the CIA, George Dillon, Weathers, on a rescue mission involving potential survivors of a Helicopter that crashed in a South American jungle. Not long after they land, Dutch and his team discover that they have been sent in under false pretenses. However they have bigger worries after they find out that an unidentified creature from out of this world has the power to take them out one by one. “Predator” is all out gritty action film, with a great cast. The punch lines and the final showdown between Dutch and the unknown creature is what make this film worth the watch. 7. The Running Man: Ben Richards, Schwarzenegger is an ex-pilot who gets framed for murder. When he escapes prison he is caught and forced to participate in a game show that involves live violence in front of a live audience. The name of the game is “The Running Man”; the participants must escape ex-cons, homicidal maniacs, and murders with different weapons that can easily take your head off. Richards and other participants involved in the game must run, and put up of a fight against their enemies in order to survive. This film is Arnold’s best in terms of his punch lines. After every kill he comes up with a hilarious saying that will have you laugh until it hurts. Although this film is an action flick, you could also consider it to be a comedy that is full of explosions and entertainment. 6. Aliens: Back on earth, nobody believed Ellen Ripley’s [Weaver] story about the “Aliens” on the planet LV-426. When it is discovered that all communication with the colony is lost, Ripley decides to aid a team of tough, rugged space marines on a rescue mission to the terrorized planet in order to find out if there are aliens or survivors who reside there. As the mission unfolds, Ripley will be forced to come to grips with her worst nightmare, but even as she does, she finds that the worst is yet to come. “Aliens” is an action packed film that always keeps you hooked. Sigourney Weaver as Ellen Ripley is a tough as nails woman with attitude and guts, similar to a Sarah Connor in “Terminator.” This film for its time was an instant blockbuster, led by one of the most impressive directors of Sci-Fi, James Cameron. A great combination of explosions and fear. A definite 80’s action classic. 5. Robocop: Alex Murphy [Peter Weller] is brutally shot to death by a street gang. Murphy’s body is reconstructed within a steel shell and named Robocop. He is very successful against criminals, and fighting crime on the Streets of Detroit. While his body is completely deceased aside from a limb, his memory is still alive, and causes him to remember the people who killed him. With this he goes after the gang members. “Robocop” is filled with entertainment and tons of action. For an ’80s film, the storyline is very solid, that will cause the excitement level to increase as you watch. 4. Blood Sport: Frank Dux [Van Damme] enters an underground martial arts tournament called the Kumite that takes place in Hong Kong. There are many fighters who have entered this tournament that have not made it alive. Dux decides to enter the tournament even though his superiors in the army did not allow him permission. While being pursued by two officers, Dux eludes them and fights in the Kumite. He goes through each opponent with ease until he faces the defending champion, Chong Li who is a vicious fighter that has killed several participants in the tournament. 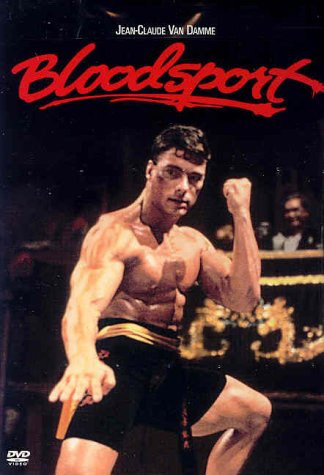 Blood Sport is the ultimate action fight film of the ’80s, arguably Jean Claude Van Damme’s best movie. It is guaranteed that you will be glued to the television during each match. 3. First Blood: John Rambo [Stallone] is a former United States Special Forces soldier who fought in Vietnam. As he came to Hope, Washington to visit a friend, he was guided out of town by Sheriff William Teasel [Brian Dennehy] who insults Rambo, but what Teasel does not know that his insult angered Rambo to the point where Rambo became violent and was arrested,. While at the county jail being cleaned, he escapes and goes on a rampage through the forest to try to escape from the sheriffs who want to kill him. Rambo’s commanding officer, Colonel Samuel Trautman tries to save both the Sheriff’s department and Rambo before the situation gets worse. “First Blood” is a classic action ’80s action flick. Rambo fights to survive as he sets the ultimate traps in order take out his foes. This film is filled with nonstop action, and causes you to be intrigued because of the fact that you experience what a man who lived most of his life in war goes through, incapable to live like an ordinary person. 2.Die Hard: When a Christmas party is interrupted by terrorists in the Nakotomi Plaza in Los Angeles, New York City Detective John McClane [Willis] has no choice but to do whatever he can to take out the bad guys, especially when his wife is one of the people who is held hostage. “Diehard” is one of the most memorable action films of the ’80s, filled with catchy one liners, and nonstop shooting and explosions. It is one of those films that will have you root for the good guy the whole way through. A classic. 1. The Terminator: A cyborg Schwarzenegger is sent from the future on a deadly mission to kill Sarah Connor, a young woman whose life will have a great significance in the future. Sarah has only one protector, Kyle Reese, played by Michael Biem, who is a soldier, also sent from the future. The Terminator uses his exceptional intelligence and strength to find Sarah, and will stop at nothing to complete his mission to kill her. “The Terminator” is not only the best action film of the 80’s it is also the smartest. Director James Cameron tells an intelligent story that puts the audience in a trance. This film is by far one of the greatest action films of all time, no questions asked.